Big ups to RD… lean gains is everything I had no idea it would be. I just wonder where it’s been all my life! Today starts week number three and already, I am seeing more results that I have on zone, strict paleo, Tim Ferris’ PAGG stack, AdvoCare, and well, pretty much anything else. This morning, my weight was 214 even. I don’t think I have been that little since about 2008. I do know that my heaviest weight since Brenna was born was about 228, so I’m down around 14 pounds. I am, frankly, amazed at how well this is working and wanted to share some of the things that I have learned so far in an effort to maybe help anyone that might also be stuck in my position. For the past few days, I have been using FitDay to track everything I eat. It has been eye opening for a few reasons which I will get into shortly. 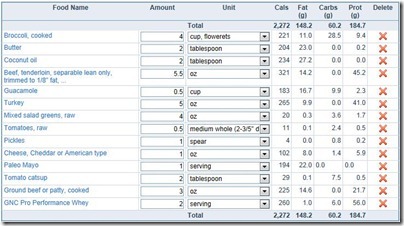 First, though, I wanted to say a word about “calorie counting”. I hate calorie counting. Always have. In fact, I hate counting ANYTHING food-wise. People pushing the paleo mentality (which I still whole heartedly agree with, by the way) usually don’t talk much about calories, nor do they encourage people to count them. Look, if you are really off the path, severely overweight, lots of health problems, etc, “going paleo” with almost literally ANY proportion of macronutrients is going to be beneficial for you. You will see results. That’s almost a guarantee. The problem comes in where you are like me. You’ve been “watching your diet” for the past 2-3 years, you work out 3-5x/week, etc and you still are flabby and fatty. WTH! I still don’t really want to promote calories/macronutrient counting on a regular basis because I, like some others, view it as a form of neurosis if done ALL the time and in EVERY situation. Picture that guy who’s counting his almonds at dinner. Sigh. I am, however, starting to see that it IS a wonderful diagnostic tool over a short period of time for someone like me who has historically had enormous problems getting weight to come off. It’s interesting to think that I have been doing it wrong for almost my entire life. I think that I was a skinny thing up until about 1st grade and it was all downhill from there. Maybe I just never knew how much was right FOR ME! Unfortunately, tracking food is the only way to figure that out (unless you’re super rich and can just have someone tell you what to do, putting food in front of you at every meal so you don’t have to think about it). As of this morning, my bodyweight was 214.0, so if I want 1g of protein/pound of bodyweight, I’d have to get, you guessed it, 214g! Looks yesterday, I got close to 1g, but not quite (.86g/pound). 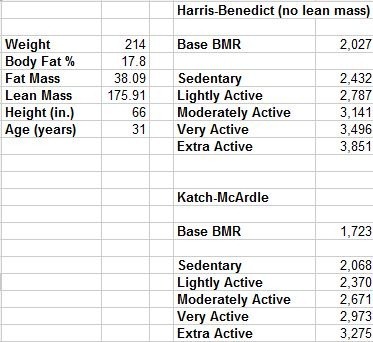 What I found really interesting here is that, in looking at my numbers above, I am starting to do this cost/benefit analysis with protein sources. For example, the beef tenderloin was 45g of protein for 321 calories. 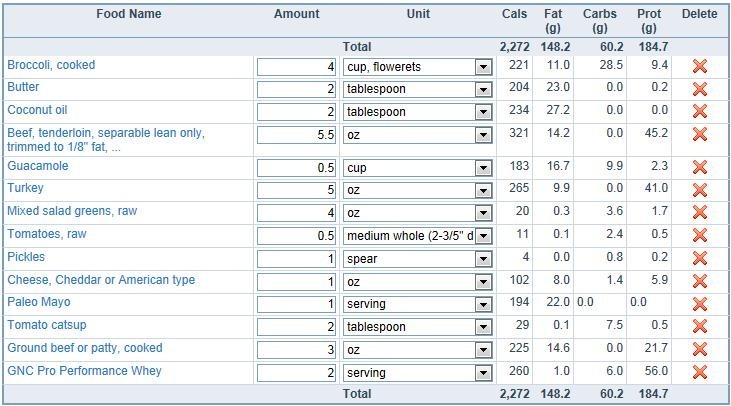 A little further down, notice that the turkey breast is about the same amount of protein for less calories. I assume this is due to that whole “calories from fat” thing. At this point, I am trying to hit my caloric markers (without being terribly neurotic about it, again, just sort of in the ballpark) while trying to get the most “bang for my buck” so to speak, protein-wise. I can say though, that when I get a high amount of protein or “enough”, I can feel it. I can feel my body cranking like a furnace. It’s a great feeling. For all of you zone folks out there, I have basically upped my protein blocks and lowered my fat blocks, I guess. If you are a regular reader here, you, no doubt, are sick of my bitching. It’s funny how you can be SO close to being right but not see any results whatsoever. It seems that all I needed to tweak was the AMOUNT I was eating and the macronutrient that is providing the majority of my caloric intake. Boom. Done. So, in the event that you eating an un-weighed, unmeasured paleo diet and feel that you’ve stagnated, you might want to start getting really specific about and how much of it you are eating. People have told me in the past “just do it for a week and you will be all set” and I was SO reluctant to listen. Turns out, with a food scale and FitDay, it’s not hard at all. There’s still stuff that I’m trying to figure out and things to tweak, but right now, SOMETHING appears to be working and it makes me really happy. 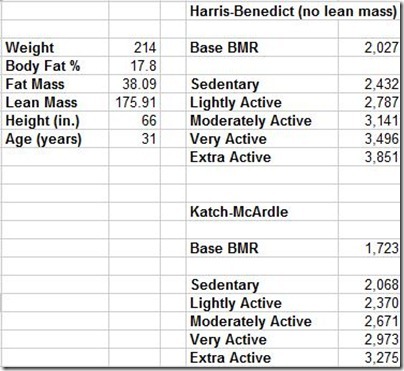 This entry was posted in Uncategorized and tagged Lean Gains on October 24, 2011 by bgoldstein.